Double Bass, the largest and lowest-pitched member of the violin family. Also known as the contrabass, the double bass is usually about 1.8 m (about 6 ft) high and has four strings tuned to sound EE AA D G (EE = third E below middle C; G = second G below middle C) and notated an octave higher. A low fifth string is sometimes added, tuned to the C below the E string. On some instruments the E string is extended at the head and fitted with a mechanism that clamps off the extra length; releasing the mechanism allows the string to sound the low notes down to C.
The Double Bass's strings are attached to the Tailpiece, and unlike the Violin and Cello, is has no fine tuners. It can also be played by being bowed or plucked. In most Jazz bands, where the Double Bass is commonly used, it is often plucked. The Double Bass can be played sitting down (It has an adjustable spike), but it is more commonly played standing up. Three-stringed basses were common in the 18th and 19th centuries (often tuned A D G) and still survive to this day in Eastern European folk music. Early basses of the 16th and 17th centuries had four or five (or, rarely, six) strings. Modern dance-band basses occasionally add a high fifth string tuned to the C above the G string. 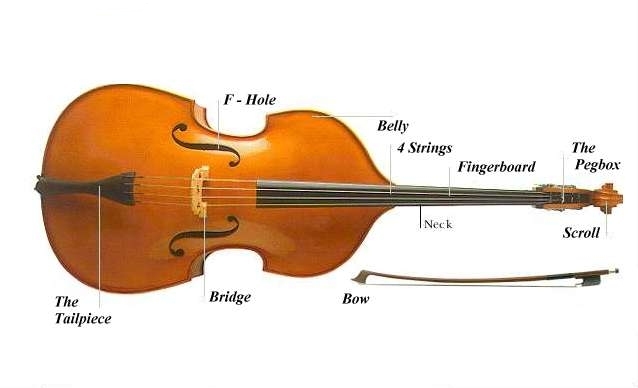 Until the 19th century, bass players used bows with the stick out-curved in relation to the bow hair - long after the in-curved bow was standard for the violin, Viola, and Cello. The out-curved bass bow continues in use alongside two in-curved models developed in the 19th century. Virtuosos on the double bass have included the Italian Domenico Dragonetti, the Russian-American conductor Serge Koussevitzky, and the American jazz bassist Charlie Mingus.